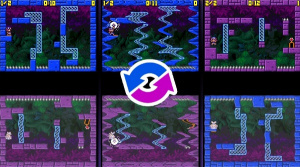 More DSiWare: Mighty Flip Champs! Mighty Flip Champs! will mark the DSi debut of WayForward Technologies. Not much is known about the game except that it takes place in a dungeon, which is navigated by flipping from room to room like pages in a book. We are promised a lot of adventure and head-scratching puzzles along the way, and Alta--our heroine--has to be constantly careful not to crush herself when flipping to the next room! 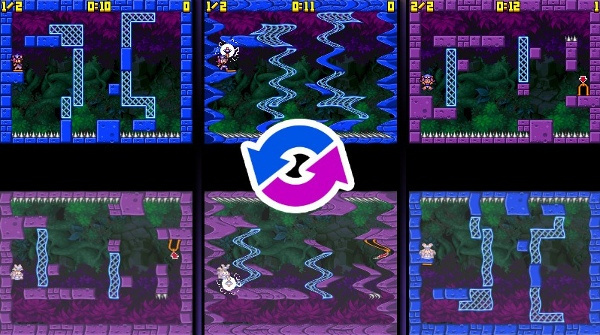 We're optimistic about this release, especially as it already stands apart from other DSiWare prospects: we'll be getting a fully original game in its own right, rather than a beefed up minigame, or simple puzzler. You may recall that WayForward recently brought us the excellent LIT, and they are also working currently on a Wii-exclusive update of the NES classic A Boy and His Blob. We're sure you'll agree that WayForward is definitely a publisher to keep an eye on. More news to come as details are released. Looks interesting. But where the heck is Shantae??? I first saw a picture of Alta a few days ago, in the Shantae fan club newsletter. They sure didn't take too long to get a real announcement out! I don't like how the DSi is being used for games, that turns it from a simple addition of secondary features into a different gaming machine. I thought he had one that was exactly like this game, something where he specifically addressed possibilities for unique DS game ideas, but I guess it wasn't a part of the 300. Anyway... DSiWare is looking promising. I don't care about the DSi having cameras or a music player or any of that, but things like this are going to make the system tempting. Anyone know anything about the DSi being more powerful than the DS? When I was in Gamestop recently, I was listening in as an employee was telling another customer all about how the DSi really is the next generation Nintendo handheld more on the same level technologically as the PSP, and not just "a DS with a camera" like all the advertising so far has made it out to be. The DSi has a faster processor and more physical RAM but it's assumed that this is more for the new interface and download service than anything else. It likely won't affect the games as Nintendo will want the new games to still work with the DS and DS Lite systems that many will continue to make use of. Well everything gets phased out eventually in favor of newer stuff. I can imagine DSi only games appearing some time to take advantage of the new features. Nintendo did with the Game Boy Color remember. I don't think I'll be getting a DSi yet though. I'm hoping to get a DSi the day it comes out, it's shiny! (drools uncontrollably). Er... I mean... it's not shiny, and won't show my fingerprints. Actually, my gold DS Lite doesn't show fingerprints all that much anyway, hooray! Can we get this on a new site soon. I'm getting depressed. This has to be an interesting puzzle-action game! As soon as I heard about this, I instantly decided to get this. It likely won't affect the games as Nintendo will want the new games to still work with the DS and DS Lite systems that many will continue to make use of. Yeah but games on DSiWare undermine that. DSiWare is a separate entity, so in reality they could make use of the slight spec upgrades. But judging from the screenshots we've seen so far, it doesn't look like that's happening. @MuljoStpho: A Gamestop employee was spouting that crap? Well, the company encourages getting sales above all else, and a lot of employees will just make stuff up if they think they can get a system reserve. I didn't especially know that the system had a faster processor and more RAM, but I'm it'll only matter for the camera, really. I agree with BassX0 about DSi-only games. In fact, I've been saying that for a while. At best, we can expect games to release that have DSi-only features, even if it does run on an older DS model ( a la Game Boy Color games that DID work on older Game Boy's). But given the fact that Nintendo isn't going to discontinue the DS Lite upon DSi's release, I expect the difference in the games to be kept minimal for a while. Maybe once they DO discontinue the DS Lite, games will start to make better use of the DSi's features. I'm hopeful for this to be released on or near the DSi's launch - I'm also really glad to see some original content early on for DSiWare. This looks interesting enough to stand out. But I also want my Shantae. "It likely won't affect the games as Nintendo will want the new games to still work with the DS and DS Lite systems that many will continue to make use of. Yeah but games on DSiWare undermine that." @Amorous Badger: since DSiWare games won't be available to run on older DS models, developers can make them in such a way that they wouldn't run on them even if they were available, making use of whatever extra power the system has, and the cameras, of course. WarioWare Snapped is proof enough of that, as it appears quite obvious that the camera is REQUIRED for play. They're probably going to phase the "old" DS out and then make DSi games so that more peopel are forced to buy the new version. Nintendo: evil but smart. @1: They are making another Shantae game. Proof is on the WayForward website.